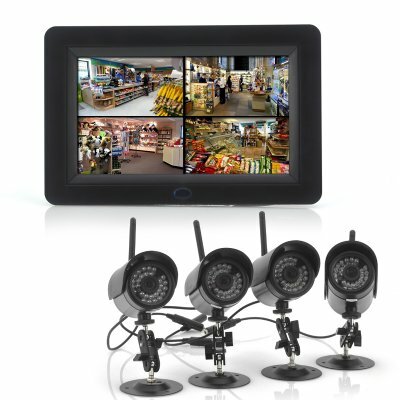 Successfully Added 2.4GHz Wireless Digital Security Video System - 7 Inch LCD 4 Channel Monitor, 4x Cameras, Night Vision, Remote Control Support to your Shopping Cart. 2.4GHz Wireless Digital Security Video System has a 7 Inch LCD 4 Channel Monitor, four Cameras, Night Vision and has Remote Control Support to let you keep an eye on your property or your loved ones. This 2.4GHz wireless digital security video system contains a 7 inch LCD monitor and four cameras to keep a clear view of all that is happening. The 7 inch LCD monitor supports up to four channels that uses 2.4GHz frequency for wireless streaming. Four camera’s screen will display simultaneously on this 7 inch LCD monitor and has a SD card slot that supports up to 32GB of memory. Easy to carry around, this monitor is perfect to keep it will you to see what each camera is seeing. The four cameras that come as part of the packaging have a 1/4 CMOS image sensor and 360 lines horizontal resolution to provide a clear view. Set this system up around your house, maybe a camera in your baby’s room so you can see how they while you are in another room. With 28 IR LEDs, each camera has a night vision of up to 8 meters therefore even in dark environments you can see what is going on. Plus there is 5 meter motion detection range too so you won’t miss a thing. This product is in stock now, we guarantee next working day shipping and offer a 12 months warranty on all our products. Brought to you by the leader in electronic devices and wholesale security systems, Chinavasion. Operating Humidity: 20 to 80 % R.H.